Before I begin, I want to disclose to anyone who might read my review of this book that I only read books I believe I will enjoy. I never select a title unless I have some confidence it will result in a positive review. I honestly wish I had not picked this particular title to review. The Woman Code has a who’s who of endorsements. Big names have given high praise to this book! I was so hopeful in its message. Sadly, I found it disappointing and difficult to finish. My problem with this book began early in its pages. 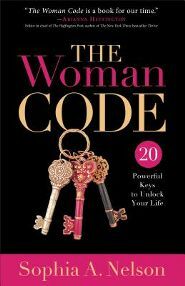 In Chapter 1, “Code 1,” author Sophia Nelson writes about knowing your value. She lists three keys to unlocking your value as a woman, the third of which is, “Shift your thinking to put you at the top of your list.” In later pages she explains this key and her explanation helps me a little with the check I felt inside about reading such advice. However, later in the book I feel like the “Me, Myself,and I” doctrine is preached and promoted. Of course there are instances where people put others needs before their own in a way that is harmful. But as a Christian, a mother, a wife, a sister, and a friend I cannot believe the “Me, Me, Me,” doctrine as a value that deserves an investment. Really, aren’t Servant Leaders the best kind of leaders? Woman or man, a person who puts others needs above their own is leading on an entirely different level. A higher one. Beyond the aforementioned issue I have with this title, there is some value in later chapters. Specifically, I do appreciate Section III The Spiritual Codes. Sophia Nelson offers some sound advice on the perils of gossip, apologizing, and controlling your thought life. It is good advice and a great reminder. Just to be clear, I hate giving bad reviews. If you were to read all of my reviews, you would believe I loved every book I have ever read. So, I am sorry I did not care for this book. I am certain the author had the best of intentions. I was given a complimentary copy of this book by its publisher in exchange for an honest review. All opinions are my own and I have not been compensated.